Three major industries appear to be overheated and will likely be shedding jobs sometime soon: health care, technology, and automotive. 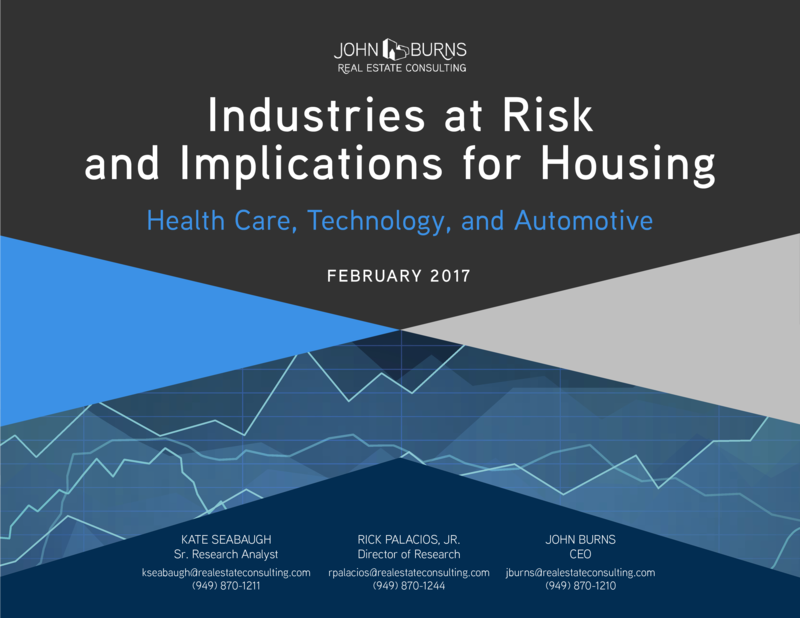 Our 68-page white paper Industries at Risk and Implications for Housing outlines our concern about jobs and housing markets tied to these sectors. Click the video link above for a two-minute introduction to this thesis. 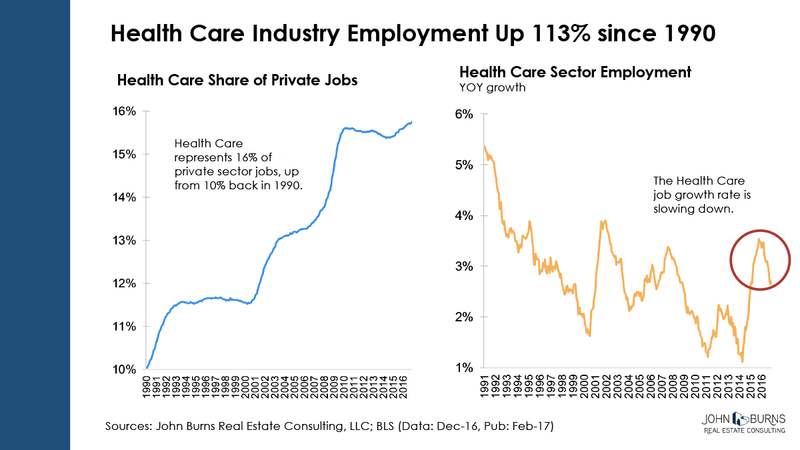 We still believe the overall economy will grow due to construction and other healthy sectors, but we are cautiously watching all three sectors—and especially health care. Health care companies have grown their public debt 308% since 2009! The number of hospitals in health systems has grown 26% since 1999, with our local teams identifying hospital construction booms in many markets around the country. Annual medical costs for a family of four have increased 180% since 2002, from $9,000 to $26,000. 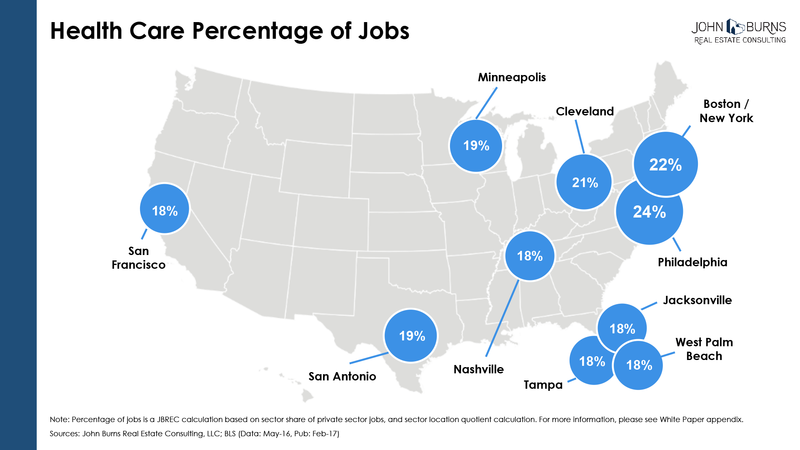 Given the high percentage of jobs tied to health care, an industry downturn poses a national economic risk. Technology companies are disrupting many industries, but their valuations have been fueled by excessive speculative investments chasing too few opportunities. Tech will have some major winners and losers, but we believe the sector as a whole is already scaling back and will continue to do so for the next few years. 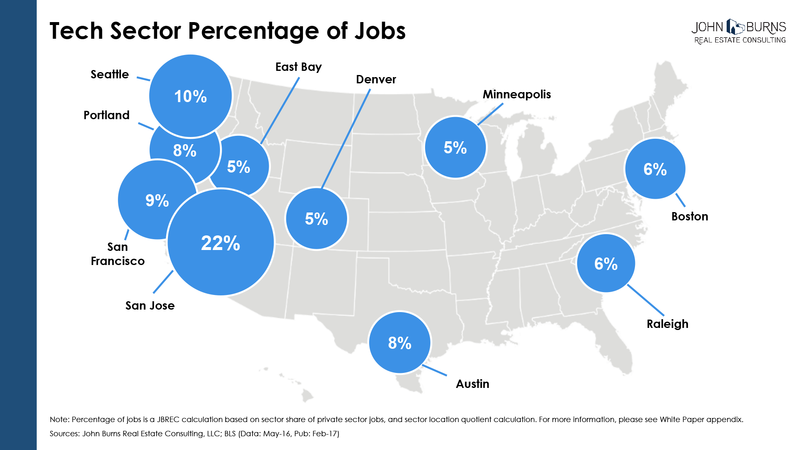 Tech-exposed housing markets including the Bay Area, Portland, Seattle, Austin, and Raleigh will be most impacted. Subprime lending is back! 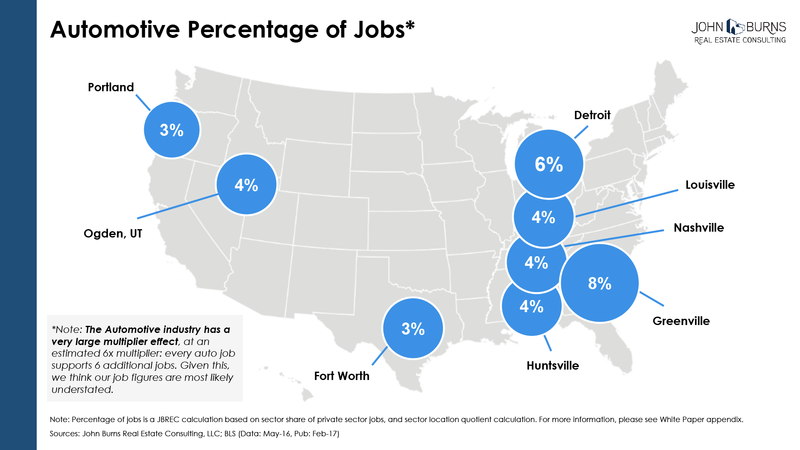 Auto demand has been fueled by a strengthening economy, lower gas prices, and incredibly easy consumer financing that resembles subprime home financing in the early 2000s. Auto sales reached all-time highs in 2016, fed largely by risky lending. We believe lending to increasingly risky consumers (with low-to-no FICO, high double-digit interest rates, and extended terms to try to keep payments affordable) will push up defaults and cause consumers to own cars that are worth less than the debt on the car. These headwinds will curb growth and force a pullback in the industry, even without accounting for the long-term threats of self-driving cars and ride sharing. The auto-heavy regions of the Midwest, Southeast, and South will be at highest risk. We have incorporated this thesis into our MSA and national forecasts, and we look forward to continuing to help our clients make the most informed housing investment decisions possible. 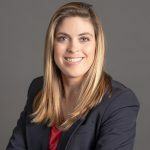 For questions or comments on our analysis, please contact Kate Seabaugh. For metro-specific inquiries, please contact one of our very knowledgeable consultants here.